Starfish, or sea stars as they are more accurately called, are marine animals that inhabit ocean beds throughout the world. Nearly 2,000 species exist. Although the five-arm species is the most common, some sea stars have as many as 40 arms. Most are carnivores, using specialized organs to feed on mussels, clams and other slow-moving organisms. Carnivorous starfish feed on clams, oyster, mussels and snails as well as on injured fish. A starfish wraps itself around the mollusk, then uses its tiny, suctioned feet to overpower the muscle that holds the bivalve closed, opening the shell and exposing the organism. Then it pushes its stomach out of its mouth, inside the shell and around the organism to begin digestion. It withdraws its stomach back into its body to finish digestion. Starfish also eat plant matter. Some species are detritivores, eating decomposed animal and plant material. Others consume sponges and plankton. 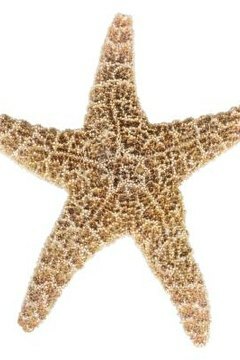 With more than 2,000 species, starfish and sea stars fill almost every ecological niche in the oceans. Those with short, inflexible arms tend to ingest prey whole before digesting, while those with longer, more flexible arms turn their stomachs inside out and pull the partially digested prey inside to finish digesting. Still others use their tubed feet to pass food to their mouths, called filter feeding. The crown of thorns starfish feeds on live coral reefs, leaving a coral skeleton that is quickly overtaken by algae. Periodic outbreaks of high populations of these starfish can kill 40 percent to 90 percent of live coral on a reef. One adult can consume up to 65 square feet of living coral per year. Starfish are extremely sensitive to changes in water temperature, salinity and pH levels, but certain species are popular for the home aquarium. For instance, the sand-sifting sea star burrows in the bottom sand and helps keep your aquarium clean by consuming uneaten food, small dead invertebrates and algae. Carnivorous animals, such as the chocolate chip starfish, move around quite a bit and will eat shrimp and pieces of squid.